What is putting girls off engineering? A tweet caught my eye today linking to a blog from Barrie Weaver. A recent Royal Academy of Engineering report states that 50% of engineering graduates don’t go on into mainstream engineering companies and Barrie’s blog then suggests why that might be the case. Apparently, when researching where to apply for a job; “I discover dozens of engineering companies presenting me with pages of facts and specifications about what they do and the equipment they use. Little about people and nothing about why I would want to work there.” Meanwhile, media, finance and consulting companies focus much more on the people, and the experience you would get working there. One example Barrie highlights is Baringa. At the end of the video, I’ve got the idea it’s a fun and challenging place to work and the sort of people I might be working with. Maybe I’m not that much wiser about what I’d be doing, but that’s probably on another web page. I was immediately struck by the resonance with the new People Like Me resource from WISE, which aims to show teenage girls how they can be happy and successful at work with examples using STEM qualifications and in STEM industries. The starting point is not the equipment you’d be working with or the even what the job would be. The resource starts with the girls; they identify attributes and personality traits in themselves and then look at the types of roles where there are people happily and successfully working with those same attributes and traits. This is a completely different approach to current methods of promoting STEM opportunities. All too often, we start with a car or a rocket, or perhaps a problem such as climate change or how to recharge phones in remote areas. We rarely start with the young person themselves. Many job advertisements will outline the role first, then add what sort of person they are looking for. These may seem a bit glib (team player, creative, a natural leader etc) but it does at least acknowledge that a human will be doing the job, not a robot. Clearly the current system doesn’t fail everyone. 50% of engineering graduates are going into engineering companies, and there could be many reasons affecting their choice – not least starting salary and job prospects. However, Barrie does raise some interesting issues. If the promotional material on the website isn’t that attractive to the budding engineer, will they see that as a reflection of how interesting the job will be? Perhaps that’s unfair, but I expect it happens. I am reminded yet again of my time on Tomorrow’s World when we had ‘post mortem’ sessions after a live show. Those who weren’t involved in that week’s broadcast watched at home and gave feedback to the rest of us the following day. It wasn’t what we, as presenters, did or said that mattered. It was what they, as the audience, saw and heard. So what are the potential recruits to engineering companies, whether large or SME, picking up from their browsing? And does it discourage them from applying? So now time for me to go and find what Baringa actually do. 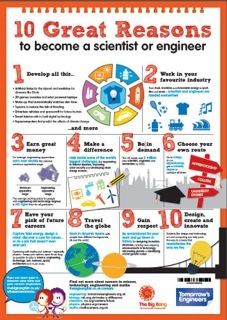 Meanwhile, here is the latest poster from Tomorrow’s Engineers with 10 Great Reasons to become a Scientist or an Engineer.